That's right; it's a how-to written for dogs by dogs. My dogs, actually. And while I'm being honest, they got the idea from Merrick* - as in dog food Merrick, and I'm pretty sure dogs everywhere will want to thank them. *Merrick's idea, but the words out of Jon Farleigh's and Dewi's mouths? 100% mine theirs! Welcome students! 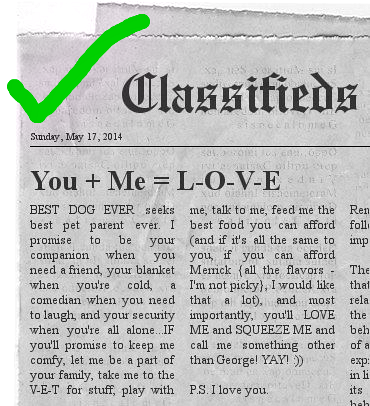 The name of this class is How to Craft a Personal Ad in Search of the Best Dog Parent Ever - 101. If that's not what's printed on your schedule, perhaps you should learn how to read. As for the humans auditing the class online: pay attention; there will be a test. Or a giveaway. Either way, you've gotta pay close attention! Alright, so let's think about our objective for a moment: We're all dogs, yes? And by design, all dogs, individually, are the best dog ever (are you with me)? Because every dog is different, and made specifically for different types of humans. So, just so I'm clear: being the best dog ever isn't bad; it's just life. Capiche? Good! Hold on, I lost my train of thought (darn cat)...Oh yes! 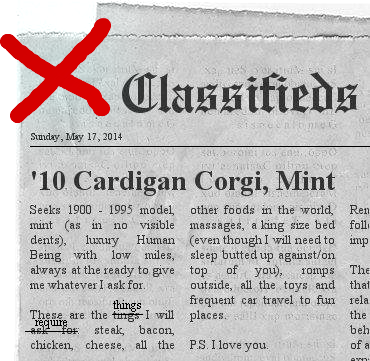 So our objective is to craft a personal ad in search of the most ideal human dog parent for our individual needs. Not that any of you are currently without a human parent, but in the terrible event you find yourself in that situation, just think how well prepared you'll be having gone through this exercise! In other words, think of it as an "insurance policy" on future inter-species matches made in heaven! Yippee! 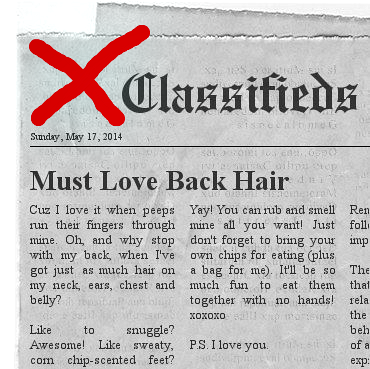 So, let's get started with a couple examples of how NOT to write your personal ad. Who'd like to tell me what's wrong with this? Hellooooo? COME ON, PEOPLE! This kind of thing might work for the dogs on the South Jersey Shore, but NOT HERE! Not unless your perfect pet parents are Snooki and JWoww! NEXT! Wow. Who here would like to buy a car? Because the only bites you're gonna get with this ad are from lonely car collectors! Wanna sit on blocks in a garage/museum for the rest of your life?! Also, all the foods in the world?! 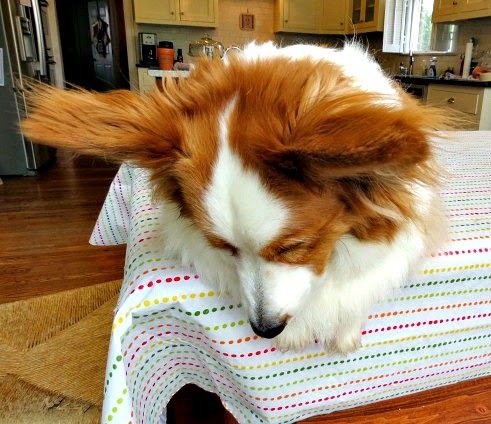 Let me guess - you slept through Dog Physiology and Nutrition 101?? Good grief! Hey, you down there! Pay attention! And you! Hecklers will not be tolerated! Alright, class, listen up. There's only one basic rule you need to remember for this ad writing business: Be your "Best Dog Ever" self! That's it! 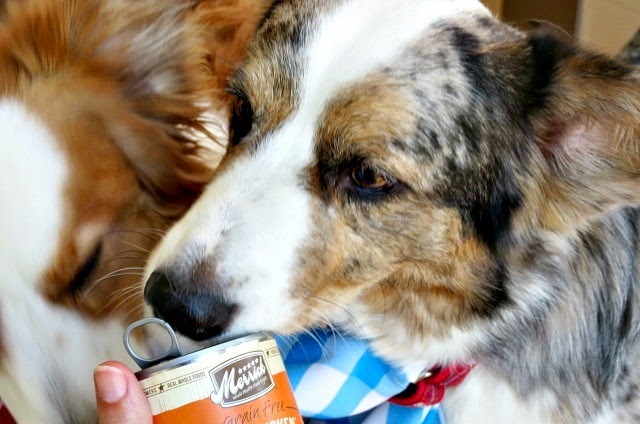 And remember, to be your best dog ever self, you need to start with a good, preferably all natural, high protein, made in the USA with locally sourced (not from China), farm-fresh ingredients DOG FOOD (like our sponsor, Merrick, makes, in fact)! And, that's where your most awesome pet parent comes in! Alright, for this next segment, I need a volunteer. Hey you, down there, get up here! Dewi: What the heck am I supposed to be doing up here, teacher? Jon Farleigh: See that can of food? Yeah, well if you lie there in front of it and look at the camera, you might actually get to eat some of it. Got it? 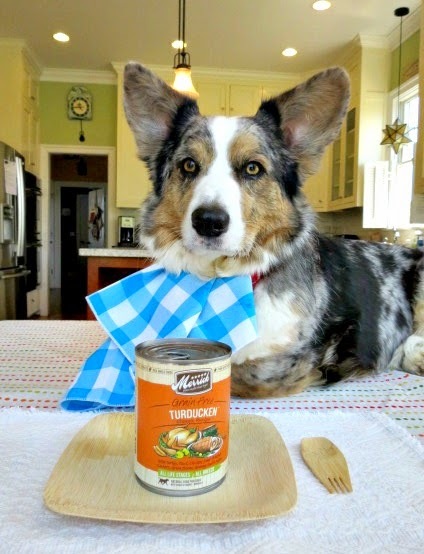 OK (still Jon Farleigh, here), let's talk a bit about dog food varieties. As in, if you could pick your own, out of all the ones in the store, what might it look like? How about this? 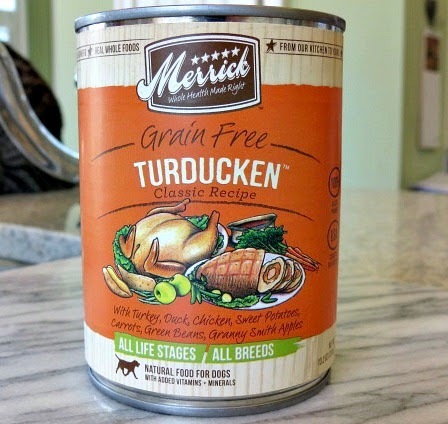 This can of Merrick grain-free Turducken (yes, like the meat Paula Deen makes for her family at Thanksgiving) might be one of your selections, yes? So, when you're writing your personal ad for the best pet parent ever, think about how you'd best get across the whole "good for you and also tastes yummy" food bit. Plus, try not to come across as an unrefined dolt, or a snoot. Good dogs are neither of those things. Jon Farleigh: Oh, mama of mamas! And that's a wrap, er...I mean the end of class! Any questions? No? Well, GUESS WHAT?! Remember how I said all you humans out there auditing needed to pay attention? Yeah, well, I wasn't kidding. Use the Rafflecopter below to enter! I'll announce the winner in 2 weeks; good luck! **Giveaway entrants must be U.S. residents and at least 18 years old. This post is sponsored by Merrick and the Pet Blogger Network. 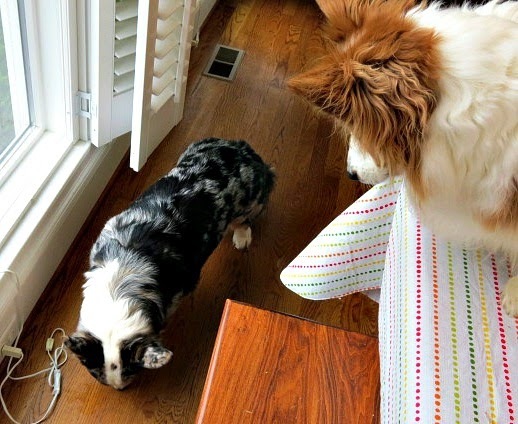 I'm being compensated for helping spread the word about Merrick Pet Care and their Best Dog Ever campaign, but Chronicles of Cardigan only shares information we feel is relevant to our readers. 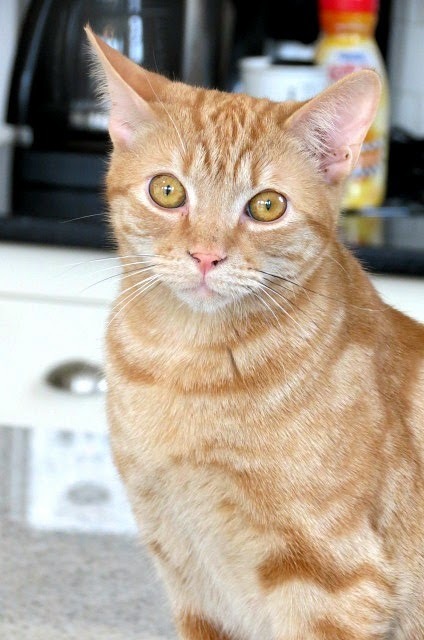 Merrick Pet Care, Inc. is not responsible for the content of this article. Lol we can see the boys loved that. Jon Farleigh's expression is priceless. Have a marvellous Monday. Best dog ever? 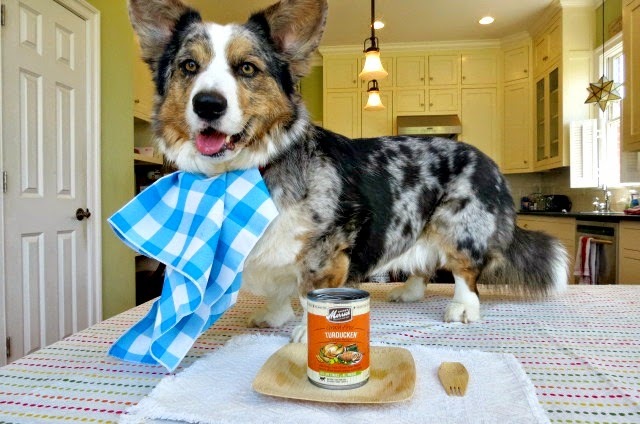 Well, he's a cardigan corgi and his feet smell like fritos. Need I say more? Love my Knuckle dog! BOL! John Farleigh...the look on your face when presented with Merrick Turducken is hilarious! I wonder if I look like that when I am getting my Merrick food?!? 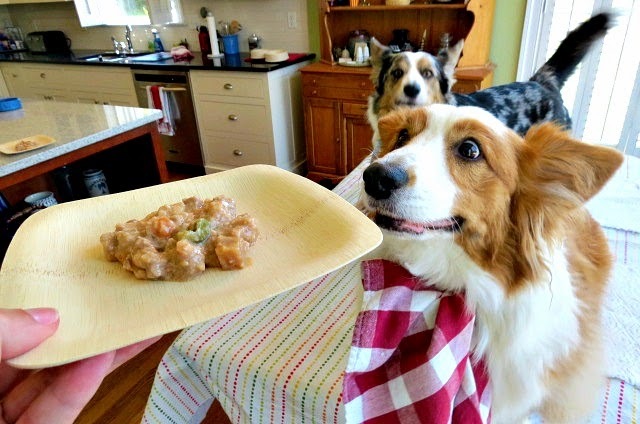 It is so yummy....it is hard to wait for it to be served! 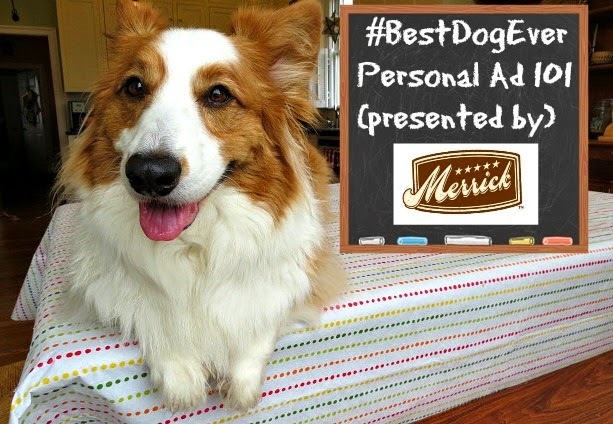 *high paw* for a great class on writing the perfect pet parent advertisement for the #bestdogever! "Our Hu-Mom made us enter and although we are pemmies, our rear ends most resemble the 'duck-en' part! We'd love to give it a go!" Love, Tate & Koda! I loved reading those ads! Especially how they all ended in "I Love you." My Dog's Are So Sweet And Loving, Making Them The Best Dog's Ever! JF's eyes when he sees the plate are hilarious! Looks like you have the best dogs ever! Jon Farleigh's face when looking at that plate of food is the best! Cute post! Hmmm... Rita is the best dog ever because... she loves and protects me! 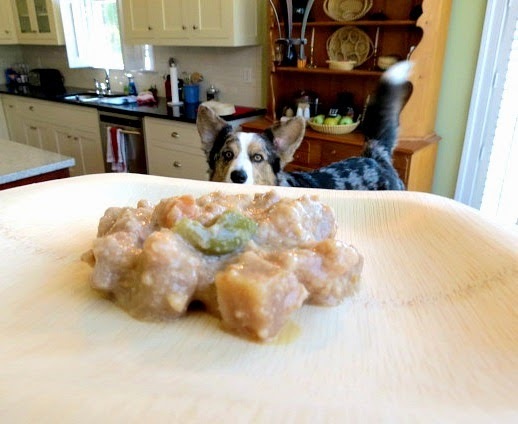 Who else hangs on my every word and looks at me (ok, corgi eye bore) and gets excited about food? Fantastic post, I hope you were compensated richly in Turducken. My dog Fussy is the dog is the best dog ever because she still loves me even if I make mistakes. Dewi and Jon Farleigh, I'd say you nailed it! This has been very informative! Waylon Godzilla is the best dog ever ... just ask is dog (and human) friends! What an adorable post! Awesome job with crafting an ad! Such a great post! Your dogs are beautiful! You did an awesome job with the post! I love all the pics! Loved this post! My dogs are the best because they love us. My dog Jax is the #bestdogever because he's my workout partner. 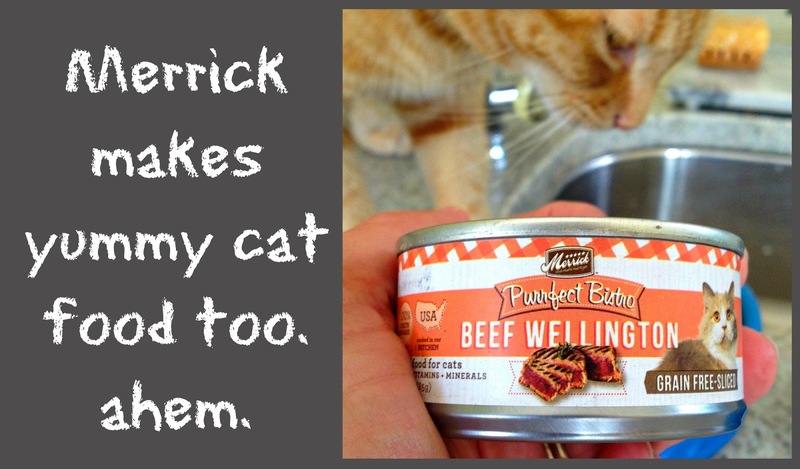 Loving these photos and the captions and Merrick is a fantastic company! My dogs are the best because they love me. My dog is the best dog ever because he is loyal, obedient, playful and watches over my kids. Our Jozi is the best dog E-V-E-R because she is always smiling the Corgi-way and we LOVE our little girl!